Even though compact cars aren't necessarily the top flavor of month at the moment, there's a seriously wide choice and some fantastic quality and value to be had in this expansive segment. Although some smaller manufacturers are gaining a foothold in the market right now, the usual suspects are still reigning supreme. So, if you're thinking of buying a new compact car, our 2017 Ford Focus vs. 2017 Honda Civic comparison will show you which one is most deserving of your attention. The Honda Civic was completely redesigned just last year, although as complete redesigns go it has to be said the changes to the exterior were pretty mild. The Civic isn't the most obviously attractive design you'll find in this area of the market, but the new generation has made a welcome turn to the more sporty side of vehicle design. We now have the hatch joining the sedan and coupe formats, which although perhaps not the best-looking of the three body styles, it will bring us the long-awaited Type R to these shores for the first time. We haven't had a thorough redesign of the Focus for some time now, but there was a modest facelift for the 2015 model year to keep the attractive Ford right up to date. The Focus looks great as it always has done, and there's plenty of diversity in the lineup for you to be able to tailor a model to suit your own tastes and requirements. At one end of the scale it can be modest, sensible and practical, while at the other end of the range it can take sporty to new heights, especially with the long-awaited introduction of the positively outrageous Focus RS model. The Honda might be slightly more individual with its current styling, but the broad appeal of the Focus and the sheer amount of variation offered makes it the winner here. There are two engines available with the 2017 Honda Civic, which are a fairly sedate 2.0-liter inline-four producing 158 horsepower and a 1.5-liter turbo-four developing 174 horsepower. The standard 2.0-liter is fine for the daily commute, but when the turbo costs relatively little to upgrade to it does question what the point of the 2.0-liter actually is. The 1.5 is easily the better choice, but even then it's not a unit that's going to get the adrenalin pumping too much. It's quiet and refined and it can feel sporty in the right configuration, but it's a long way from being a standout reason to consider a Civic. Buyers are confronted with three different engines to choose from in the 2017 Ford Focus, and a good case can be made for choosing any one of them. 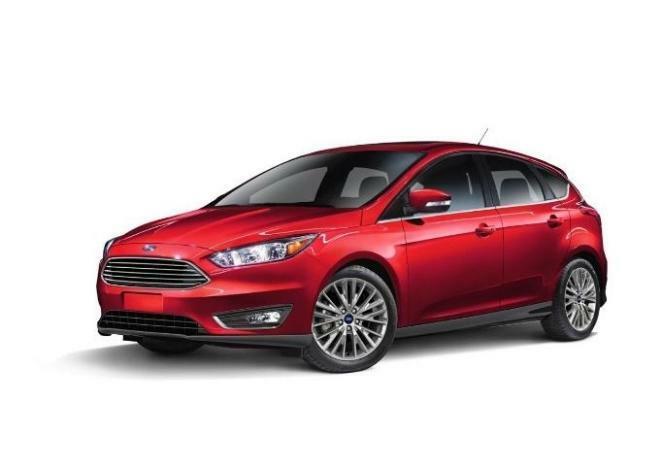 The standard engine in most models is a 2.0-liter inline-four just as in the Civic, but the Ford unit gives you 160 horsepower and 146 lb.-ft. of torque to play with. Next up is the sensational 1.0-liter three-cylinder EcoBoost, which provides plenty of power and some excellent fuel economy ratings for its relatively modest displacement. But if you really want performance to write home about, the Focus ST delivers it courtesy of a 2.0-liter EcoBoost that puts an impressive 252 horsepower and 270 lb.-ft. of torque at your disposal. The excellent chassis and steering of the Focus completes the performance picture and makes it not only superior to the Civic, but possibly the one to beat in the entire segment. And that's without even touching on the stunning, but limited in availability, RS performance model. You can have pretty much anything you want in your Honda Civic, but the enhancements are not exactly what you'd call "a la carte." If you don’t want to go up a trim level the enhancements are largely bundled together into various packages. That's fine if you want everything included in a package, but it can mean having to pay for things you might not necessarily want or need to get a feature you do want. The standard trims are fairly well equipped, but things can get expensive if you want to get a Civic that's just right for you. In its base S guise, the Focus can be a fairly basic and lightly equipped offering, but there's plenty of opportunity to get the car that's exactly right for your needs without having to pay more than you may feel you have to. It also depends on what we actually consider as basic these days too. After all, even the Focus S comes with air conditioning, an AM/FM/CD audio system, Bluetooth audio streaming, 15-inch wheels, a rearview camera, power features and steering-wheel audio controls. The huge choice and competitive pricing makes the Focus much better in terms of standard and available features and equipment, as well as how they can be added to the model of your choice. Both of these cars sell in massive numbers and it's not difficult to see why. The 2017 Honda Civic is a fine car and it's definitely a more desirable model than many may have seen it as in the past, although the performance doesn't really deliver on the promises made by the sporty styling. On the other hand, the 2017 Ford Focus can be pretty much anything you want it to be, from an affordable little runabout to a fire-breathing track monster, and just about everything in between. If the Focus in front of you isn’t the right car for you, there's going to be one somewhere else in the family that is, and it's not going to break the bank to buy it either.